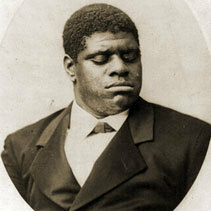 Thomas "Blind Tom" Wiggins was born on May 25, 1849 on the Wiley Edward Jones Plantation in Harris County, Georgia. Blind at birth, he was sold in 1850 along with his slave parents, Charity and Mingo Wiggins, to Columbus, Georgia lawyer, General James Neil Bethune. The new owner re-named the child Thomas Greene Bethune or Thomas Wiggins Bethune (according to different sources). 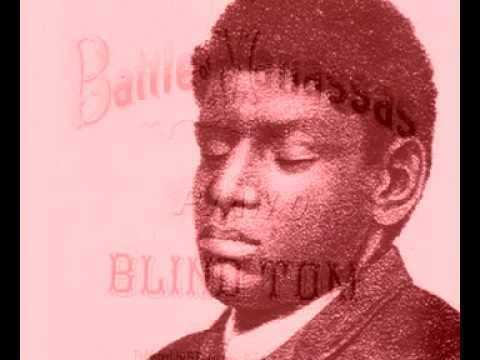 Thomas "Blind Tom" Wiggins (May 25, 1849 – June 14, 1908) was an African American autistic savant and musical prodigy on the piano. He had numerous original compositions published and had a lengthy and largely successful performing career throughout the United States. During the 19th century, he was one of the most well-known American performing pianists. Tom was born on May 25, 1849 with a condition that today's doctors might diagnose with the politically correct term "autistic savant"--one of only about 100 cases recorded in medical history. Blind Tom was born into slavery in Columbus, Georgia in 1848. His master, Wiley Jones, unwilling to clothe and feed a disabled ‘runt’, wanted him dead and, if not for vigilance of his mother, Charity, Tom would not have survived his infancy. But when Tom was nine months old, Wiley Jones put the baby, his two older sisters and parents up for auction, intending to sell the family off individually and not as a unit. The chances of anyone buying blind infant were remote - his death was as good as certain.